Doug and I just returned from a very enjoyable and successful buying trip for Ever Irish Gifts, this time visiting England and Wales. We’ve been to England before (and love it), but Wales was a new experience for us. Like the rest of the British Isles, it’s a beautiful country with warm, welcoming residents, but it’s got a personality all its own. Located on the west coast of the Isle of Britain, the entire country is about the size of Massachusetts, and we covered a lot of it on foot and by car, which really is the best way to see and get to know a place. Here are some of our observations of wonderful Wales. 1. Sheep are practically everywhere. Not in the cities, of course, but as soon as we left the motorways and meandered onto the smaller roads, winding our way from village to village, the landscape was dominated by sheep. 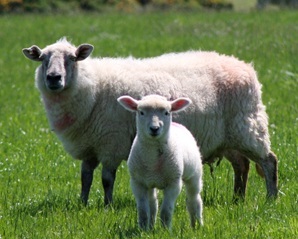 Because our trip coincided with the Easter holidays, we had the delightful privilege of seeing all the young spring lambs, frolicking (the only way to describe them) in the fields with their mothers. So adorable, and it never got old. 2. 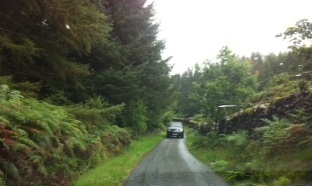 The country roads are really narrow, and people drive really fast on them. In the villages, the speed limit is generally 30 miles per hour, but as soon as you cross outside the town limits, it jumps to 60 miles per hour. And believe me, people (definitely not us) do drive that fast. Sixty miles per hour on roads that twist and turn, frequently are bordered on both sides by high stone walls, and sometimes barely seem wide enough to fit one car, let alone two. Add the challenge of driving on the “wrong” side of the car and the road and it all adds up to a real adventure–and a few more gray hairs. But hey, that’s part of the experience. 3. Walking is huge. By walking, I don’t mean strolling-walking. 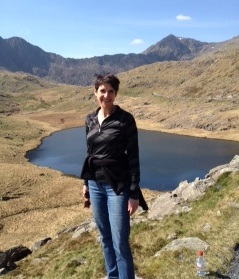 I mean vigorous, get-your-heart-pumping hiking-walking, and Wales is the place to do it. Northern Wales is especially ruggedly beautiful, and the Snowdonia region, which surrounds Mount Snowdon, is the destination for walkers. We spontaneously pulled over by the side of the road to follow a stream of walkers preparing to tackle the hike up to the mountain’s peak (an elevation of 3,560 feet, the highest mountain in England), and while we decided not to attempt the full distance, our outing provided dramatic views of a lovely lake, the snow-capped peak in the distance, and free-roaming sheep (of course). 4. Welsh is a fascinating language. English is spoken throughout Wales, but Welsh (also known as Cymraeg) is very much alive and well–and absolutely is not a form of English. 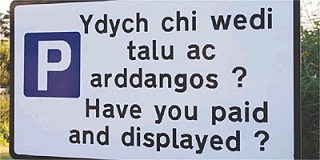 Schoolchildren learn it as a first or second language, and because the country is officially bilingual, most everything is written in both Welsh and English. 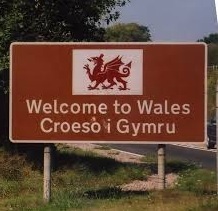 Interestingly, when we first crossed the border into Wales from England, signs were in English first and Welsh second, but as we progressed deeper into the country, the order changed. Could we pronounce a word of it? Not a bit, although we tried, much to the gentle amusement of the native Welsh speakers. Most definitely NOT an English dialect.